When the copper tiles on Mansfield's famous Clock Tower which was once part of the Metal Box Company factory were ripped off and stolen it was a sad day for such an iconic structure. It was decided the way forward was for Matthew Watson and his son Frazer to use their considerable skill and experience in fibreglass pattern making and roofing work in order to restore the clock tower to its former glory and to take away the risk of further metal theft by replacing the old copper tiles with identical looking bespoke fibreglass tiles. Having made a range of wooden patterns for the tiles to give them an aged effect the fibreglass tiles were produced in the Flat Roofs Manchester workshops. The workshops have seen a range of GRP products being made over the years from car and truck bodywork through to dovecots and dormers. Once the new GRP tiles where made it was time to safely access the Dome at the top of the tower and start work. Matthew was amazed that the thieves had climbed the tower and ripped off the old copper tiles. " It's a long way up and space is very restricted. As experienced roofing contractors, we had to carefully plan how to access the tower and work safely as we installed our new GRP tiles. The thieves had risked their lives as well as spoiling an historic landmark. 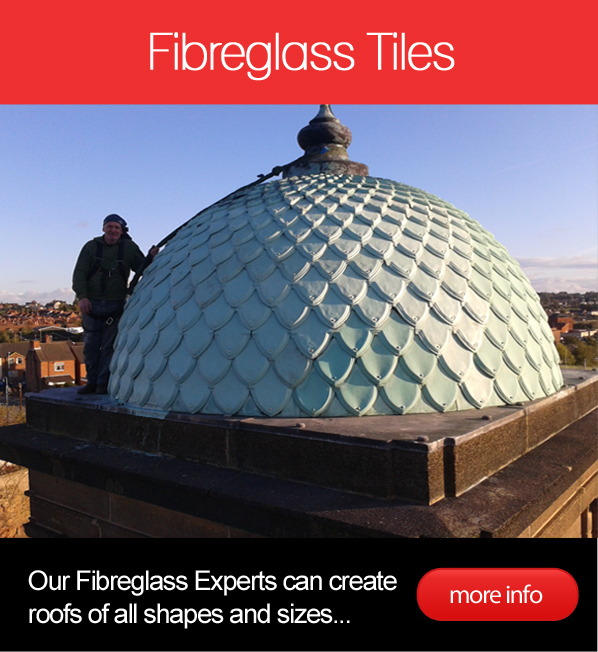 We are very proud of the tiles we made and of the installation which has restored the towers dome to its former glory." We love to be involved in one-off jobs which combine design, artistry, pattern making and production. We have all of these skills in the locker having designed and made everything from Victorian fountains to the Footwork Formula 1 car body work. 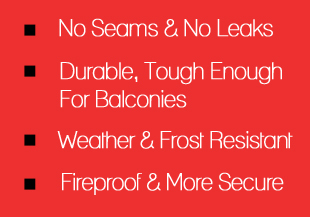 All new-build and replacement GRP roofs from Flat Roofs Manchester fully comply with Part L Building Regulations. New build flat roofs can be constructed with a heat loss of only 0.20W/m2 and refurbished roofs with a heat loss of 0.20 W/m2. Glass Reinforced Polyester (GRP) is often better known as the trade name "Fibreglass". Since its discovery at the end of the second world war it GRP has been used in many application which need a lightweight material which is very strong, waterproof and highly resistant to corrosion and sun and rain. GRP is made from a polyester resin which is reinforced by short glass fibres in the form of a mat. The Polyester Resin together with the Chopped Strand Mat form a laminate. GRP also has the advantage of a beautiful finished appearance. Boats, Storage tanks, fishing rods, car and truck bodies are just a few of the products made from GRP fibreglass. Before the introduction of carbon fibre technology Matt Watson of Flat Roofs Manchester build the bodywork of the Footprints Formula 1 racing car and many other sports and racing car parts. 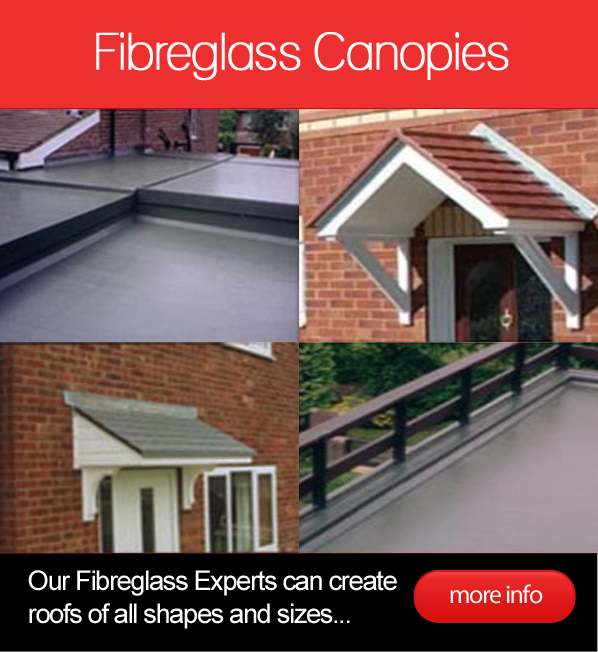 As a second generation family owned and run business we have been installing GRP /Fibreglass roofs for over 30 years. Out original roofs are still in great order, looking good with only a quick clean from time to time and removing the misery of leaking felt covered roofs. We always build our GRP Fibreglass roofs on new Oriented strand board (OSB)(Sterling Board), and we can then give a 20 year guarantee with confidence. Other areas we cover apart from Manchester include: London, Barnsley and Chesterfield.